Aquaria Marina Betta Kit Purple-V - Rick's Pet Stores Inc. Designed for convenience, Marina Betta Kits include everything you need to quickly set up, showcase and maintain your betta. 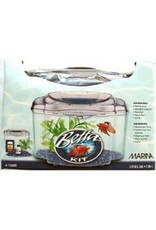 Each kit includes a clear plastic aquarium with a uniquely coloured top that blends in nicely in a variety of household or office settings. 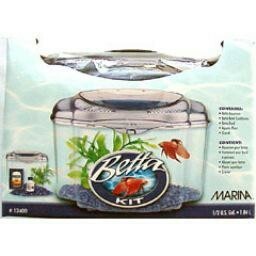 This Marina Betta Kit comes complete with a 1.89-litre (0.5 U.S. gal) plastic aquarium with purple top, natural purple gravel (500 g/1.1 lb), Nutrafin Max Betta Food (3 g/0.1 oz), Nutrafin Betta Plus Conditioner (60 mL/2 oz), and a Plastic Plant with suction cup It’s so easy and convenient with Marina Betta Kits.